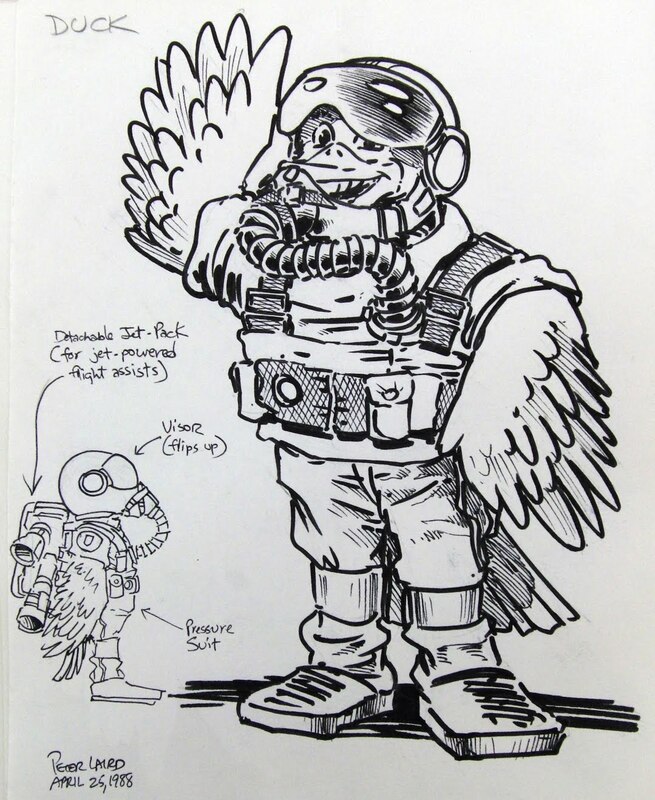 In past installments of Awesome Turtles Pictures, we looked at some character evolutions, such as how "Terrorpin the Terrible" became Tokka, or how Baxter Stockman got fused with a character called "The Fly" to become Baxter-Fly. Today, we're going to look at how some toy design pitches evolved into the recognizable characters we ended up getting. 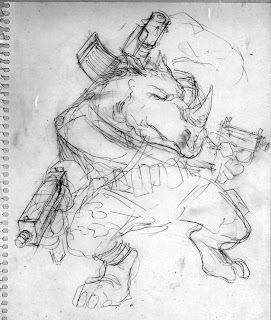 First up is Peter Laird's initial sketch for "rhino mutant". Guess who he wound up becoming? 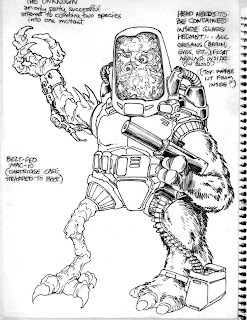 So yes, contrary to popular belief, Eastman and Laird did do the original design and creative work for Fred Wolf/Playmates characters such as Bebop and Rocksteady (think about that next time you accuse them of hating the Fred Wolf/Playmates characters and concepts). 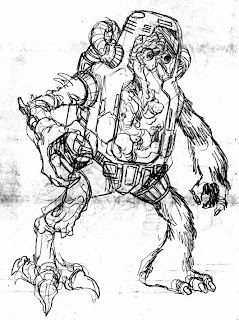 Interestingly, a LOT of these action figure pitch sketches I've got stored away are credited to Peter Laird; I'm having a hard time finding any by Kevin Eastman. Seems either Laird pitched a lot more toys than Eastman did, or Eastman simply hasn't shared his sketches online like Laird has. Here's another one labeled simply "duck". 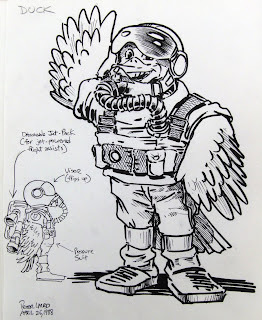 This guy dropped the flight suit, put on a bomber jacket and became Ace Duck by the time his toy was molded (though in the case of the Archie comics, he dropped the flight suit and slipped on a revealing speedo, but the less said about that the better). Here's a character named "Scalien". His robotic exoskeleton brace giving him mechanical limbs reminds me a bit of Fishface from the Nickelodeon TMNT cartoon and toyline. 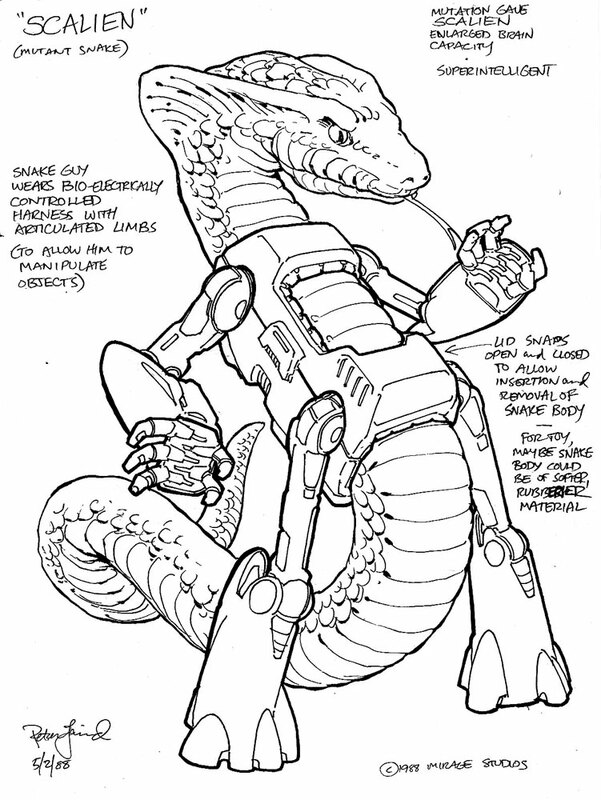 Being a mutant cobra, however, he may be a predecessor to the Playmates character Scale Tail, who dropped the robotic limbs in exchage for, like, snake limbs. On a snake. That 80s toyline was weird, man. These next two sketches are for a character called "The Unknown" (love the name), who is described as being a failed attempt to combine two animals into a single mutation. He wound up evolving into Mutagen Man, who it seems will be making a comeback in the Nickelodeon TMNT cartoon. Some wild stuff. And those are the ones that actually MADE it to the shelves in some form or another. 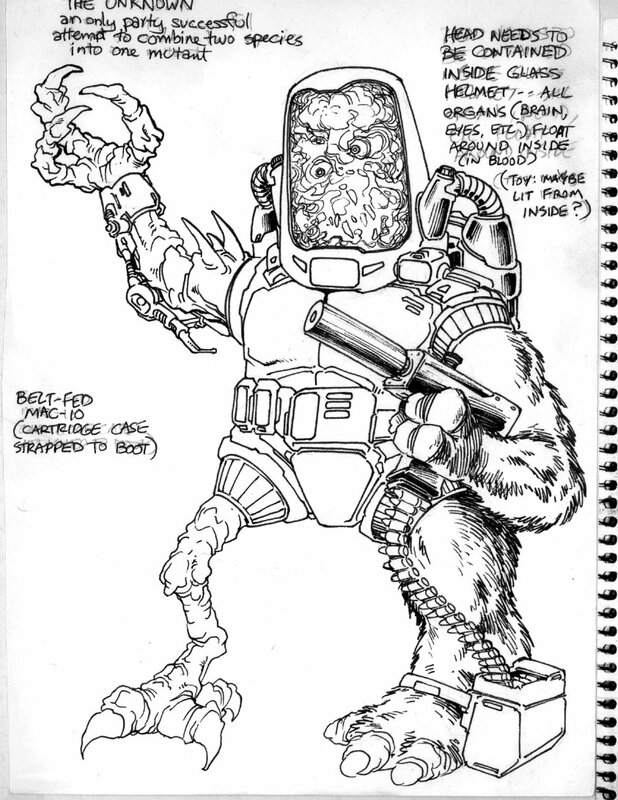 Believe it or not, but there were design pitches considered too weird for the 80s toyline. To my knowledge Mutagen Man already made his debut in the Nick toon. Someone correct me if I'm wrong, I don't really follow the show. The Pulverizer got turned into mutagen goop in a jar, but he hasn't become Mutagen Man yet (though clips confirm it for season 2). It's amazing how much of that art was converted for the 80's toyline (and alas, the last we'd see of such creativity in the TMNT toylines, IMO). 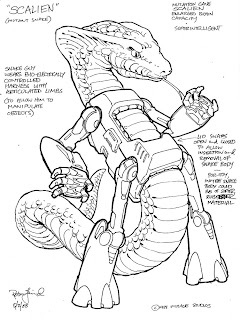 I'm just surprised (and a little depressed) that Armaggon got rejected, because Playmates thought a mutant shark cyborg was too much in the early 90's? Maybe, after 20 years and the hype of Sharknado, Armaggon will finally get a chance at being a toy. Doubtful, but we can dream, can't we? Don't forgot these sketches of Bebop and Rocksteady. This stuff is cool and all, and I'd hate to sound rude, but I'd prefer review of the rest of the Turtle Soup short stories to more installments of Awesome Turtle Pictures. Just my two cents.